1 Soak 8 wooden skewers in water. Separate the onion quarters into individual petals and mix in a bowl with the beef, garlic, bay leaves, red wine vinegar, olive oil and 1⁄2 the parsley. Season and set aside to marinate while you make the pickle. 2 Heat the cider vinegar, sugar, mustard seeds and 400ml water in a medium pan on a medium heat, until the sugar dissolves. Add the asparagus and bring to the boil. Turn the heat down and simmer for 2 minutes. Set aside for 10 minutes. 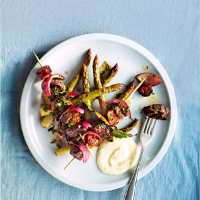 3 Drain the beef and onion, reserving the marinade, and thread onto the skewers, alternating with the chorizo and marinated bay leaves. Heat a griddle pan over a medium heat and griddle the skewers for 4 minutes on each side, until cooked through. Meanwhile, gently simmer the marinade in a small pan with the butter and remaining parsley. Drain the asparagus and serve with the skewers, spooning the sauce over the top. Pair with a dollop of aioli and some toasted sourdough, if liked. This recipe was first published in Thu Jul 13 10:57:00 BST 2017.